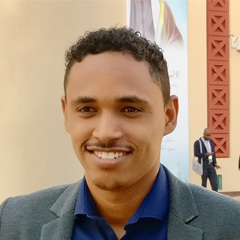 Mr. Abdelmjeed Mohamed is currently working as a laboratory specialist at King Fahd University of Petroleum & Minerals, Dhahran, KSA. Previously, he worked as a teaching assistant at the petroleum engineering department, University of Khartoum, Sudan. During his master’s study, he was involved as a research and teaching assistant and he joined two research projects between KFUPM and WellFlow service company in well stimulation and filter-cake removal. He was also an executive member of the Students’ Society of Petroleum Engineers (SSPE) and University of Khartoum Petroleum Engineering Alumni (UoKPEA). M.Sc. in Petroleum engineering [January 2017], King Fahd University of Petroleum & Minerals, Dhahran, Saudi Arabia. A. K. Mohamed, S. A. Elkatatny, M. A. Mahmoud, R. A. Shawabkeh, A. A. Al-Majed. 2017. The Evaluation of Micronized Barite as a Weighting Material for Completing HPHT Wells. Paper SPE-183768-MS presented at the SPE Middle East Oil & Gas Show and Conference held in Manama, Kingdom of Bahrain, 6–9 March. M.A. Abdalla, A. Hassan, A. Abdulraheem, S. M. Elkatatny, A. K. Mohamed. 2018. New Technique to Evaluate the Performance of Hydraulically Fractured Horizontal Well. Paper SPE/IADC 189390 presented at the SPE/IADC Middle East Drilling Technology Conference and Exhibition in Abu Dhabi, United Arab Emirates, 29–31 January. Best graduation project award at Petroleum Eng. Department, University of Khartoum, Khartoum, Sudan .